Peter Marshall reports on US claims that a British-born lawyer encouraged the suicides of some Guantanamo detainees. On June 11 this year dawn broke over America's detention centre in Guantanamo Bay to reveal macabre scenes whose impact would stretch all the way to the White House. Three of the detainees had hanged themselves in their cells. To human rights campaigners it was the ultimate evidence of the despair of those incarcerated indefinitely without charge. To the Americans it was a ploy, what the prison commander termed "an act of asymmetric warfare" by hardened al Qaeda terrorists bent on martyrdom - a coordinated effort to discredit the Americans. In the immediate fallout, President Bush's plans to hold the first military tribunals for detainees had to be abandoned while the deaths were investigated. (This was days before the US Supreme Court compounded the President's discomfort by ruling the Tribunals illegal anyway). And then, as the investigation proceeded, some in the US military indicated they had suspicions as to who had plotted the suicides. Their theory was that a Saudi-born British resident, Shaker Aamer, who has a wife and four children in London, had called for the deaths from his cell. And they came up with the startling allegation that a renowned British human rights lawyer, Clive Stafford Smith, was the mastermind who had put him up to it. Stafford Smith's American colleague, Zac Katznelson, says he was told by one of his clients in Guantanamo in August that interrogators were trying to implicate the lawyer: "that he put him up to it, that it was Clive's idea, Clive's brainchild, that people had to commit suicide to bring attention to the base and to then force the government to close it." One of the military officers threatened me and told me that they thought I was behind the hunger strike and threatened to put me in that cell. Shaker Aamer is a man who provokes starkly opposing views but both his defenders and jailers agree he's a charismatic individual, a natural leader. Clive Stafford Smith believes this has marked him out in Guantanamo Bay. "The military clearly thinks he's dangerous, not just in the sense that they think he is a leader in Guantanamo Bay, but they've got it in to their minds that because he's so outspoken, he's some big figure in Al Qaeda, which is something that's just not true." When I point out that Shaker Aamer commands respect even among prisoners who are al Qaeda supporters, Stafford Smith responds, "I command some respect among the prisoners in Guantanamo, because I've been so involved in the cases, no other reason. That doesn't mean that I'm a leader of Al Qaeda." 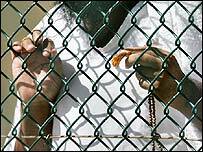 In 2005 when prisoners at Guantanamo began a hunger strike, Shaker Aamer was put into isolation. When Stafford Smith visited he faced his first accusation. "One of the military officers threatened me and told me that they thought I was behind the hunger strike and threatened to put me in that cell. And I was really incensed by that. I wrote them a letter saying, I don't want to hear anything more about this or I'll suing you people." After this, with the hunger strike showing no sign of breaking, the US command adopted a new strategy. With Shaker Aamer in an isolation wing, they placed one of Guantanamo's youngest detainees Mohammad al Guarani, in the next cell. As Zac Katznelsonm describes it the two had had a "sort of a father son relationship" from their arrival in Guantanamo. "So they thought that if they brought Mohammad in, he could convince Shaker to give up the hunger strike. He actually does convince Shaker to stop the hunger strike. But supposedly, according to the interrogators, during this time, Shaker passes the message to Mohammad to deliver back to the main cell. To deliver to prisoners. And the message supposedly is from Clive Stafford Smith. And the message is that somebody needs to die for Guantanamo to close. Clive never, ever would say such a thing." The would be messenger, Mohammad al Guarani, says he was threatened with being put in isolation himself unless he'd implicate Clive Stafford Smith. The lawyer himself is irate. "Well unfortunately, I think they're targeting me over these suicides in Guantanamo because the military doesn't want to accept the prisoners got depressed because they've been treated so badly. So they want to point the finger of blame wherever they can. And in terms of the evidence, they've been interrogating a young kid, still only nineteen, trying to get him to say that I was telling people to commit suicide, which is flagrantly false, but it's dangerous," he says. "I spend all of my time trying to stop people committing suicide. I can't tell you the number of my clients who have got really depressed and have talked to me about wanting to take their own lives. And the last thing I want is for my clients to come out of Guantanamo in a wooden coffin. I want them to come out alive." The Pentagon won't comment on what is an extraordinary allegation against an internationally respected lawyer. But one senior officer who was in Guantanamo at the time confirmed to Newsnight that he personally had held suspicions about Clive Stafford Smith - although he had no evidence. He said Shaker Aamer would be energised and difficult after Stafford Smith's visits, although he acknowledged this could be because he had just seen a sympathetic human being who had reminded him of his legal rights, denied in Guantanamo. The officer also said he wished he'd had a better understanding of "Arab culture".